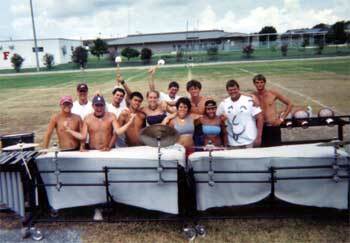 Tonya E. Mashburn, who played in the Spirit pit in 2001, 2002 and 2003 (and who attends the (University of North Texas), sent in this one. "This is a picture of the 2003 Spirit pit. It was taken the last day of tour in Orlando. We all are very close and had a wonderful summer. For me, I couldn't have asked for a better group of people to spend my summer with. They are all amazing musicians and lifelong friends. "From left to right, C.J. Rolison (2000-2003), Ronnie Pascal (2003), Bob Nash (2002-2003), Brandon Dodge (2003), Phillip Morgan (2002-2003), Kelly Knowlson (2002-2003), Ben Weed (drum major, 2002-2003), Tonya Mashburn (2001-2003), Will Campbell (1999-2003, and an age-out), Kehri Magalad (2003), Adam Kindler (2003) and Matt Garland (1999, 2000, 2003)." Thanks Tonya!